This project appeared in our shop a couple months ago – an ornately carved sculpture, a classic English style hunting theme. The rabbit, the crow, the rifle, flask, leaf work, all the symbolism imaginable. Carved in English brown oak with an extremely fine detail. Every feather, every line of fur. The carving came in cracked and very dry – we helped the cracks along and then relgued the sections filling in any missing material. The entire piece was cleaned, a fresh coat of hand cut garnet shellac applied, and then a generous amount of wax. 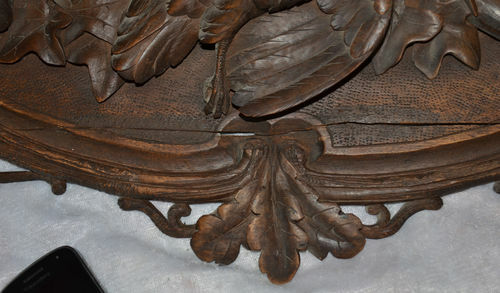 Not a super complex restoration – but time consuming with all the detail to clean and pick free of dirt and dust. 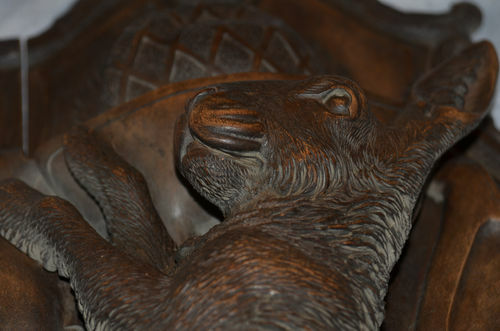 We’re not 100% sure where this came from and when it was made, the story behind it says it’s back as far as the 1700’s but we’re not convinced of that. There is no signature or maker’s mark noticeable on the piece, which is annoying, we would really like to trace it’s lineage. 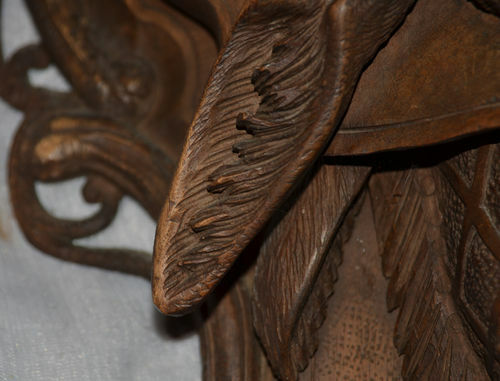 There’s a limited venue of carvers who can accomplish this, which pays some reference to a Grinling Gibbons piece, but yet remains just short of some of the fine delicate detail that would lead us towards his work. My father could carve this from scratch – I don’t think I could! I could restore small sections, replace and blend missing carvings … but the ability to do this from scratch is a dying art form! Wow that carving is amazing! Nice restoration that must have been nervewracking, i would be terrified to do irreparable harm. Looks like you did. Great job…..
And some think society is advancing? Beautiful piece. 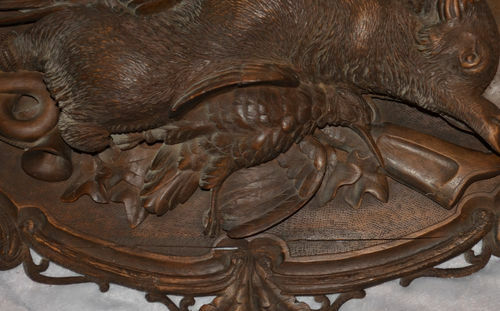 I cannot imagine carving that detail on Oak. I would be real apprehensive to touch it.. Nice work resetting it. That carving is magnificent. Great job on restoration. That’s a family heirloom! It’s not as scary as you think to work on this type of stuff, we do it all the time. Antiques / museum pieces / artifacts … etc. Just take your time, think before you act. This was reasonably simple – piecing in some extra material and regluing it. It’s a bit of a shock to some people to finish breaking something but it’s the only way to ensure the repair is complete. If you half fix a crack, it will in the end split the other direction. So – always break it the rest of the way then reglue the whole break. The rest was carving in some small sections that were missing, blending the surface, and the finish. English brown oak makes it easy – it carves extremely well. Color can be tricky, it takes time and you just have to play around for a while and experiment. Take an extra piece, carve the surface and lay it next to the area you are blending. Work on the scrap piece, when you know what you did on that to make it work – go do it on the real piece. Awesome piece, thanks for posting.